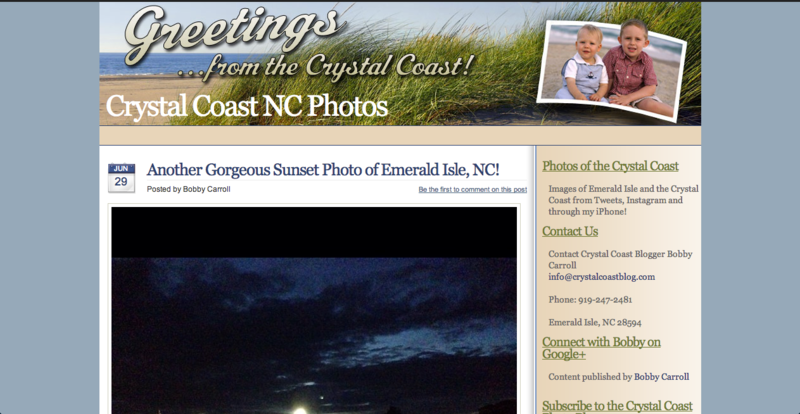 The Crystal Coast Blog » Tweet Us Your Emerald Isle, NC Twitpics and Instagram Photos! Well, not you but your shared Instagram and Twitpics for sure! And we will give photo credit to each photograph linking back to your website, Twitter profile or Instagram profile. Let us know if you wish to have your Emerald Isle vacation Twitpic or Instagram photo published to our Photo Blog and we will post it ASAP! If we see awesome beach photos, photos of the sunset from “The Point”, pictures of families having a terrific time, we may Tweet you and ask permission to publish your photos on on photo blog. Keep Your Emerald Isle Photos G Rated! We will only post family-friendly photos. It’s how we roll! We Look Forward to Posting Your Amazing Photos Soon!